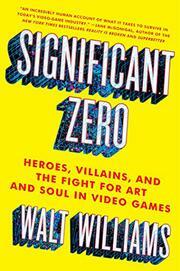 Looking back on the decade he spent helping to create some of the most memorable titles in video gaming history, Williams comes clean on scripted violence, workplace politics, situational morality, and the deleterious effects of little sleep and a junk-food diet. In 2013, the outrageous “Grand Theft Auto V” earned $1 billion in just three days after its release. Such huge profits often demand teams of creators sacrifice their souls on the altar of the gaming gods. Louisiana-born Williams did just that as a brash 20-something short on cash but long on dreams of making it as a writer in New York City. After Marvel Comics shut the door in his face, he managed to cultivate a few old college ties into an interview with the burgeoning 2K Games. Both acerbic and witty, the author not only charmed his way into a professional gig playing video games; he also earned the respect of “The Fox,” the legendary 2K honcho who would consistently elevate Williams inside the gaming industry’s arcane hierarchy. The author was also able to survive the “Crunch,” or single-minded, all-consuming focus needed to bring top-notch video games like “Spec Ops: The Line” to market. The work drove him to confront conflicting personalities and thorny morality questions head-on in a quest to deliver the kinds of immersive video games fans love to play. “Whatever it takes to make you feel something, we’ll do it,” writes Williams. “But that’s not always enough. Sometimes, to get your blood pumping, we have to let you decide how far you’re willing to go.” In the case of “GTA V,” that means “running over civilians with a car, shooting police officers, sleeping with prostitutes and then killing them to get their money back.” But the author is completely fine with all of that and more, and in this bitingly acrid chronicle, he explains why. An entertaining and provocative look inside big-time video game development.